If there’s one makeup item I absolutely can’t live without, it’s my Maybelline mascara. Just like Jackie said in her Valley Girl post, the stuff is truly phenomenal and makes my eyelashes look kind of amazing. Serious. So anytime something new and “amazing” comes out, I’m always hesitant to try it out. But with all this crazy new stuff out there, I decided I’d go on a mascara review spree. First up, this Blinc Kiss Me Tube Mascara. The description itself was so odd, I couldn’t pass up trying it out. The brand’s “tube technology” is totally innovative. Just apply like regular mascara, as many coats as you see need ( I do at least a half a dozen for fluttery, come-hither lashes) and when the mascara sets, it forms tiny water-resistant tubes around each lash making them look superlong. It doesn’t run, smudge, clump or flake and won’t smear from crying or sweating. To remove, apply some pressure and warm water, you literally see little tubes flake off in your hands. I’ll be honest, this kind of freaked me out a little but it’s not your eyelashes falling out, it’s the tubes that formed around them. And the mascara totally made my lashes nice and long. 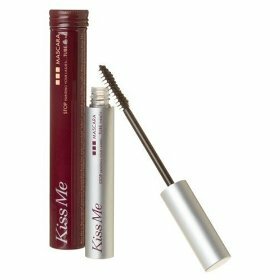 Blinc Kiss Me Tube Mascara is available in black, dark brown, medium brown, dark blue, dark purple and dark green. I love CoverGirl’s Marathon mascara–been using it forever. I’ve tried so many high-end mascaras and it just flakes off. Sounds like this one is good, though. This stuff sounds awesome. Do they sell this in stores anywhere? Sounds like a knock off to Kevyn Aucoin and Becca’s mascara, the “tube” theory does work though.